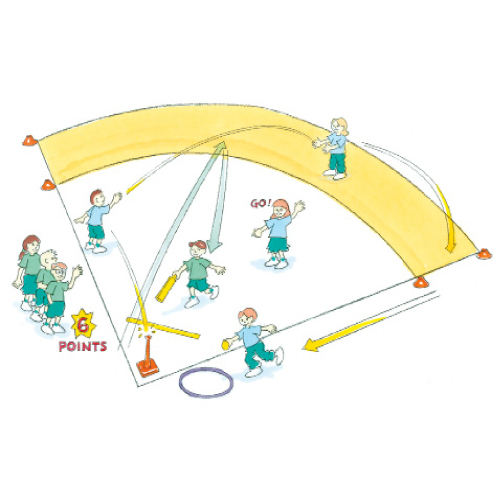 Hit hit throw and go is a fielding game that develops teamwork. The batters are challenged to place balls tactically and fielders to position themselves effectively and return the balls in the shortest possible time. Play in teams of 4. In a marked diamond area, divide your players into 1 fielding team and 1 batting team. Fielders are not allowed inside the base lines and not allowed to move until the last ball has been thrown into the field of play. The batter hits 2 balls off a tee and throws 1 ball into the field of play. The player can either run the bases or run/walk back and forth between 2 markers to score runs for their team. As the last ball is thrown, fielders collect all 3 balls and place them in the hoop or bucket as quickly as possible to minimise run scoring. Where can we hit and throw each ball to make it harder? As a team, where should you position players to stop the ball getting past? What is a fast way to get all 3 balls in the bucket?